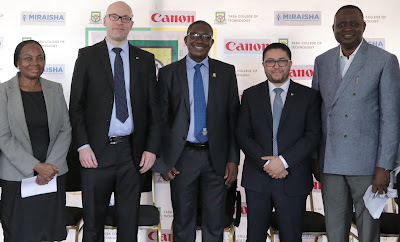 L - R: Matt Kelly, EMEA (Europe, Middle-East and Africa) Market Intelligence Manager, Canon; Engineer Obafemi Omokungbe, Rector, Yaba College of Technology and Nizar Abdoui, Product Manager, Canon during the commissioning of Yaba College of Technology-Canon Printing Academy in Lagos. 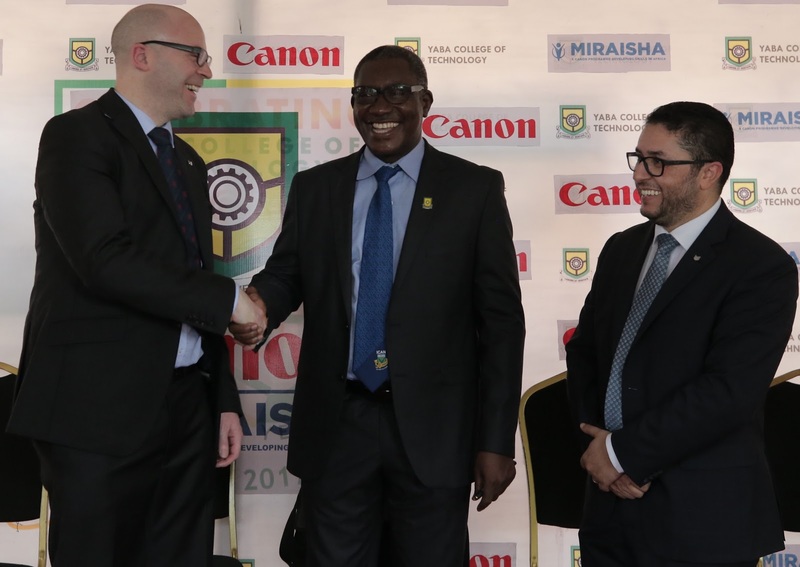 Canon will be holding print training for students at Yaba College of Technology which is Nigeria’s first higher institution to have established a Centre for Entrepreneurship Development. Lagos, Nigeria; 1st April 2019 – Canon Central and North Africa (CCNA) a leader in imaging solutions, has signed a 3 year partnership agreement with Yaba College of Technology (Yabatech) to support students in their professional development by conducting print workshop training with Canon specialists. L - R: : Dr. Titilayo Ukabam, Deputy Rector Administration, Yaba College of Technology; Matt Kelly, EMEA (Europe, Middle-East and Africa) Market Intelligence Manager, Canon; Engineer Obafemi Omokungbe, Rector, Yaba College of Technology; Nizar Abdoui, Product Manager, Canon and Dr. Kunle Adeyemi, Dean, School of Art, Design and Printing, Yaba College of Technology during the commissioning of Yaba College of Technology-Canon Printing Academy in Lagos.